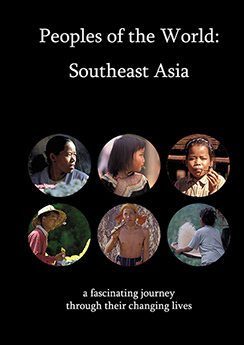 The first feature-length documentary in the Peoples of the World trilogy is Southeast Asia (2010). This film is not rated. Due to some images and themes we consider it unsuitable for young children. We therefore advise parental discretion. "Travel to Southeast Asia and see how tradition challenges change at the beginning of the twenty-first century. With captivating photography and an in-depth narrative this documentary takes you inside the history, the customs and the modern lives of the people who live in this part of the world. Presenting a compelling case for the education of indigenous people, Peoples of the World: Southeast Asia will leave you re-thinking what you thought you knew about this region." Rent it: You can stream it, for private viewing, for 72 hours for US$ 1.49. Buy it: You can buy it, for private viewing, with unlimited streaming and digital download for US$ 4.49. Teach with it: The educational edition is available to non-commercial educational institutions in a dual-pack DVD/Blu-ray combination, accompanied by extensive teachers' notes, for US$99. Please contact us if you are interested in further information on how to obtain the educational edition for your school, college or university. Private, commercial, for-profit educational institutions may also contact us for commercial educational licensing.